I found out recently how long a broken bone takes to heal. In late January this year I went for a walk after dinner. A summer shower had swept though earlier in the evening, the hot day was cooled and the dry grass was refreshed by the deluge. This I thought, was the perfect time to get out and enjoy the fading light. On my walk I encountered a steep embankment and arriving at the bottom of the descent, I slipped on the wet grass, felt a crack in my left ankle and the next thing I remember I was on the ground embarrassed and in pain. Most of us can identify with this situation, however after trying to walk I noticed that my left ankle was foreign to me. It was extremely unstable and the pain in the area and inability to walk (along with some not so subtle prompting from my wife) had me arriving at emergency for X-rays not much more than an hour later. These X-ray films confirmed what I already knew to be true. 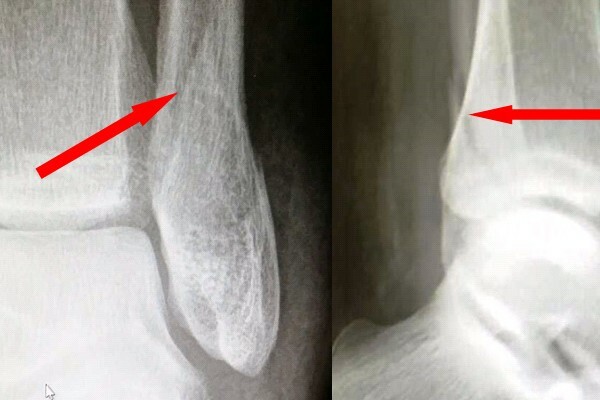 I had fractured my left ankle at the bottom end of the fibula, the smaller bone at the outside of the ankle. Fortunately my ankle fracture was stable, or not likely to move and surgery was not considered necessary. I was put in a ‘back slab cast’, issued two crutches and told to stay off it with an appointment made for two weeks in the future for evaluation. Mike’s broken fibula. You can see the fracture site pointed out by the arrows diagonally through the bone. This is the first X-ray about 2 hours after the injury. Nearly everyone I know either has broken a bone or has someone in their family who has broken a bone. So, how do broken bones mend with out being screwed and bolted back together and how does the human body repair the area of trauma to cope? The big question is how long will this take to fix? This phase starts as of the moment the injury occurs. Bones have a blood supply and the process of breaking it causes trauma to the injured area. Blood is no longer constrained by the veins and arteries in the area and spills into the surrounding tissue. This triggers inflammation. Think of inflammation as the bubble wrap of your body. It protects and stabilizes an injury site and in the process squashes any nerves in the area leading to great discomfort for you! This pain is nature’s trigger for telling you to stop and rest. This period of inflammation lasts roughly seven to ten days after the injury. The ‘back slab cast’ is to allow for further inflammation as the size of the injured area changes over the coming weeks and is usually replaced with a full cast once the inflammation has subsided. At the beginning of this stage, the patient is usually put into a full cast or a special walking boot or brace. Things begin to change as the inflammation decreases. Some of the blood clots which formed after the injury are being replaced by soft callus bone which is strong enough to prevent further injury in an immobilized patient. A type of white blood cell known as an osteoblast begins its work to bridge the gap between the two pieces of bone. The soft callus slowly fills the gap between the bones over the next few weeks returning some strength to the bone and further stabilizing the area. This ‘soft callus’ is then replaced by harder callus which becomes mineralized and forms bone which can be seen on x-ray. At the end of this phase the traditional 6 weeks is up and there is enough strength in the bone for the patient to return to basic activity. Mike’s ankle 6 weeks after the initial injury. 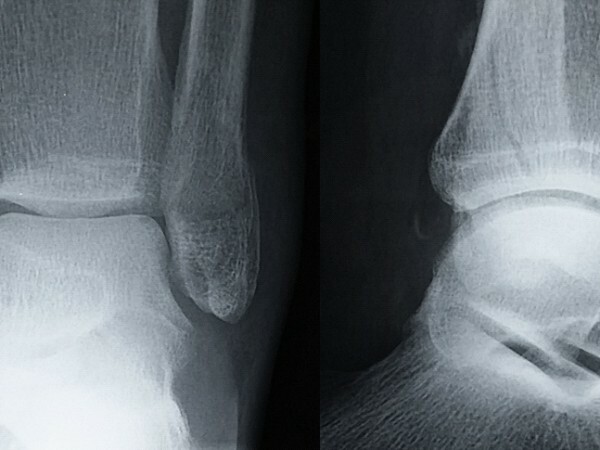 The X-ray to the left shows that healing is nearly complete but the one on the right clearly shows the gap has narrowed but not fully healed. In this final stage the hard callus bone is remodelled and replaced by strong compact bone. This process can take a further 6 months after the initial injury. Only after this process is completed does the bone return to its full strength. 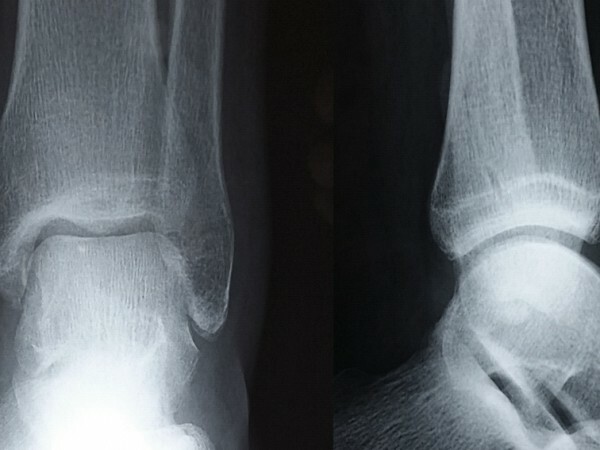 The initial patch up done by the inflammatory and reparative stages is also reshaped and remodelled so that the bone returns to its original shape. New blood vessels form and area accommodated and the patient may finally return to normal activity without fear of the bone reinjuring in the same location. Mike’s final X-rays 11 weeks after the injury. 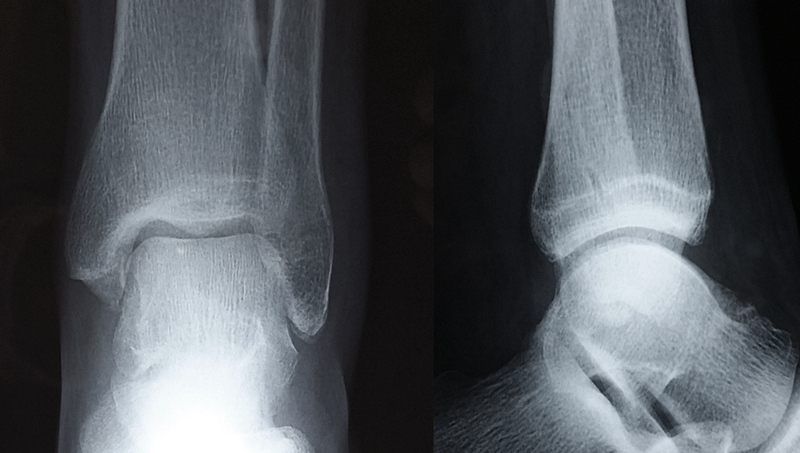 There is no sign of the injury on the left and the right X-ray shows that the gap in nearly healed fully. This means that he was able to begin basic weight bearing without the aid of a CAM walker or crutches. But with work to attend, kids to chase, and chores to complete, how long does all this take? Well, in a young, fit healthy individual the rule of thumb is that phase 1 takes 7 to14 days, phase 2 takes another 28 days and phase 3 takes a further four and a half months. So phase 1 and 2 together take roughly 6 weeks. This is the one that most of us are interested in as this is the amount of time that we need to be on crutches or in a cast or CAM walker. However, because your feet are the furthest away from your heart, they can receive less blood and as a result can take longer to heal. Weight bearing on a broken ankle can double this healing time. My experience saw my heal time back to unassisted walking take 11 weeks. The final stage can take a lot longer than 4–5 months. It all depends on your injury site, your age, your habits, your compliance with non-weight bearing (podiatrists make terrible patients!!!) and your general fitness before the injury occurred. The most important thing to remember and be thankful for is that your body is an amazing piece of engineering. Given the right conditions, a broken bone will heal itself while you wait. The only thing that you need to do is to be patient, follow any instructions given and let it rest. Casts, special CAM walkers and crutches can all help the site to remain immobile and heal. The best thing you can do is be patient!